Instagram takes the shopping experience to the next level. Since yesterday you can buy goods there without leaving the app. Tap the image of a shopping post (bag icon at the bottom left) to see the tags of individual products. Select a product and you will be taken to the product page. Here you can select some options, such as color and size for garments, and then click the “Checkout on Instagram” button. Now fill out your name, e-mail address, as well as billing and payment information. This only happens at the first purchase. Instagram remembers the payment information to fasten future purchases. Now confirm the order and that’s it. You will be notified of the shipment status of your order by notification. The checkout feature is only available in the US and for selected brands for now. Instagram gains tremendous benefits by introducing the feature. 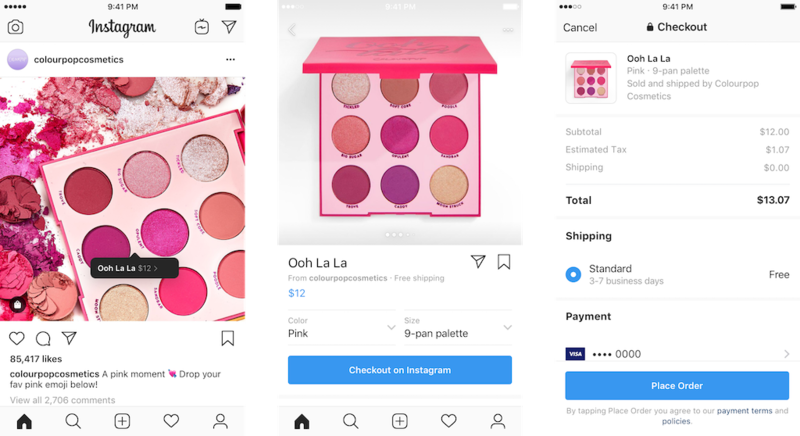 Users who discover products on the platform will not be redirected to the provider’s website as before but will stay on Instagram throughout the whole purchasing process. By storing the payment data, the process is so smooth that it is very attractive for sellers to offer their goods there. Instagram seems to be increasingly evolving towards a sales platform for businesses. We are curious how well this will be received by those users, who really only want to watch pictures and stories there.